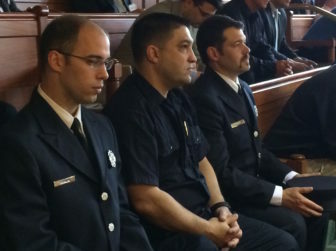 Three members of Uniformed Professional Fire Fighters of Connecticut listen to the debate in the Senate. The Senate overwhelmingly approved a bill Tuesday that would provide Connecticut’s firefighters with lost-wage coverage for work-related cancers. The bill, which the Senate adopted 35-1, cleared the House unanimously last week and now heads to Gov. Dannel P. Malloy’s desk. Malloy spokesman Devon Puglia said Tuesday the governor intends to sign the measure. “The kinds of cancer that are prolific amongst firefighters is something that we need to start addressing,” said Sen. Cathy Osten, D-Sprague. The measure represents a compromise between Connecticut’s firefighters and its municipalities. The former originally fought for an an expansion of workers’ compensation coverage — something the Connecticut Conference of Municipalities argued would place a significant fiscal burden on communities. The bill establishes a modest relief fund to cover wages lost by firefighters during their treatment for cancers that have been linked to the chemical fumes generated when the synthetics used in modern construction and furnishings catch fire. The relief program is somewhat controversial in nature. It will be funded by redirecting one penny of the 51-cent surcharge on land-line and mobile telephone bills from a fund for the state’s 911 system. Those pennies are expected to generate $400,000 a year, and no benefits will be offered until the new fund collects the telephone revenue for three years. Sen. Robert Kane, R-Watertown, who cast the lone vote against the bill, said Connecticut should try to assist its firefighters, but he believes the federal law governing the 911 surcharge does not permit the use established under this bill. Kane added that he fears Connecticut might disqualify itself from some federal grants by pursuing this diversion. If that happens, “we will work that out next year,” responded Sen. Edwin Gomes, D-Bridgeport, co-chair of the Labor and Public Employees Committee. The relief fund will be administered by firefighters. Eligibility requires evidence that the applicants do not smoke or use other tobacco products and that they are trained in the latest cancer-prevention techniques for fighting interior fires. Connecticut is the only state in New England and one of about 14 nationally without a legal presumption that at least some cancers in firefighters are job-related, meaning the burden in those states is on employers to show the cancer had another cause.